Regalia Writing Labs is the brainchild of Ralph Reyes, a college student who also happens to be a genius with nibs. Ralph explains that he was fascinated by flex nibs and Sailor Nagahara nibs, but because he couldn’t afford super expensive vintage flex nibs or Nagahara nibs, he set out to create his own. You can see a gallery of his creations here. A few weeks ago, Ralph posted a new nib on his Instagram account (@reachingralph) called the Crossflex Nib. Only fifty nibs were available, and I snagged one for $150. The nib came in a small box decorated with a wax seal lookalike accompanied by Ralph’s business card. The nib is a screw-in JOWO #6 steel and it fits a variety of pens, including Franklin-Christoph, Opus 88, Newton Pens, Herbert Pens, Carolina Pens, Woodshed Pen Co., Kanilea Pens, Desiderata Pens, Scriptorium Pens, and others. The ebonite feed and housing were specially designed for this nib by Flexible Nib Factory. I put the Crossflex nib into my Opus 88 Koloro (review here). The Opus 88 is an eyedropper pen, and Ralph recommends eyedroppers to supply plenty of ink to the nib. I didn’t try the nib with a converter or piston-fill pen, but I suspect a converter would starve the feed. Durability, snapback, softness, control. These are the qualities I search for, not "mushy" maximum flex. While this nib is designed primarily for flex writing, with extraordinary softness, the lines delivered must be beautiful. The sensation of creating those lines must be a pleasure. Snapback was highly prioritized when creating this nib. The nib starts as an extra fine, but with Ralph’s handmade modifications, it can flex up to 3mm. I didn’t try pushing it that far, but I will say that the nib flexes beautifully. 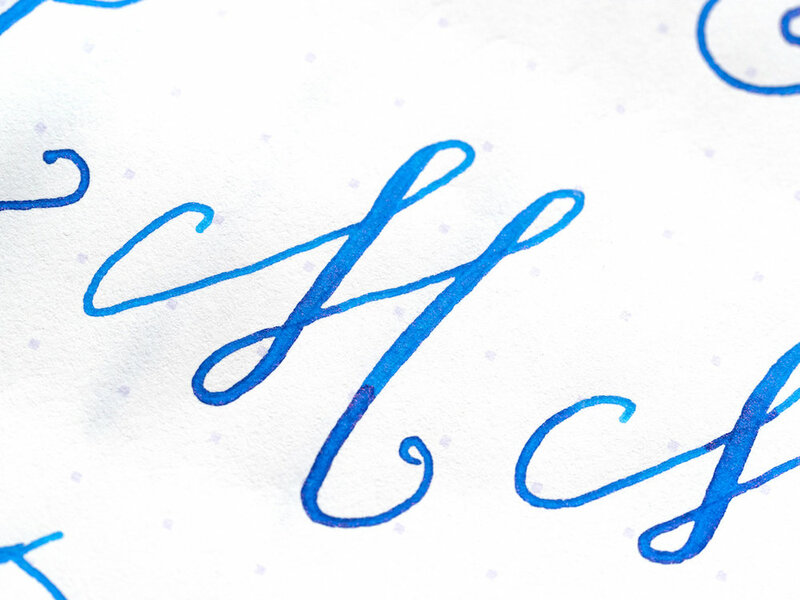 I practiced writing my formal calligraphy alphabet with the nib, and the results were every bit as good as a dip pen with a flex nib. When I measured the pen’s flex, pushing as far as I was comfortable doing, the lines measured a little over 1mm. Like I said, the nib is made to flex up to 3mm, but I never pressed it that hard. This nib is a joy to write with. Unflexed, it is smooth and bouncy. The tines are perfectly aligned. When you write with flex, the nib behaves beautifully. The tines spread with gentle pressure and snap back with ease. You can really press into the nib without being afraid that you’re going to spring it (though Ralph warns it is possible to push it too far). I am thrilled with my Crossflex nib. It makes my Opus 88 the perfect calligraphy practice pen. I no longer have to deal with the mess of a dip pen, but I get the kind of flex I want to form my characters. Unfortunately, this run of Crossflex nibs sold out quickly, and there are no more. Ralph typically sells his nibs at pen shows, but occasionally he sells them via his website (as he did with the Crossflex nib). The best way to keep apprised of nib sales is via his Instagram account. But it’s definitely worth going to his website to see all the amazing and fantastical nibs--one of his creations has nine tines! Posted on November 9, 2018 by Susan Pigott and filed under Regalia Writing Labs, Pen Reviews.